Middle Island Light Station is located in Lake Huron, halfway between Thunder Bay Island and Presque Isle. There are 7 buildings on the island, including a light tower, Keepers Quarters, an Oil House, Tool Garage, a Fog Horn building and two brick privies. The light is 78 feet above low water and can be seen for 17 miles. 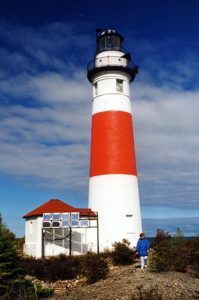 Visitors can take a day tour of the island, or even spend a private night on the island in a rustic lodge by contacting the family that owns the lighthouse grounds. The lighthouse can also be seen from a boat.